We study the ambulance relocation problem in which one tries to respond to possible future incidents quickly. For this purpose, we consider compliance table policies: a relocation strategy commonly used in practice. Each compliance table level indicates the desired waiting site locations for the available ambulances. 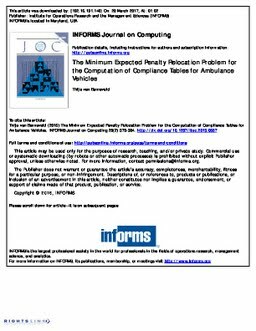 To compute efficient compliance tables, we introduce the minimum expected penalty relocation problem (MEXPREP), which we formulate as an integer linear program. In this problem, one has the ability to control the number of waiting site relocations. Moreover, different performance measures related to response times, such as survival probabilities, can be incorporated. We show by simulation that the MEXPREP compliance tables outperform both the static policy and compliance tables obtained by the maximal expected coverage relocation problem (MECRP), which both serve as benchmarks. Besides, we perform a study on different relocation thresholds and on two different methods to assign available ambulances to desired waiting sites.